A 9-year-old boy presented to our outpatient services with complaints of headache in the left frontal region associated with on- and off-vomiting for the last 6 months. Neurological examination was normal except for mild left hemiparesis (4+/5 power, Medical Research Council grading). Magnetic resonance imaging (MRI) of the brain revealed a space occupying lesion in the right posterior frontal region. It was cystic with a small mural nodule on the lateral aspect. It was hypointense on T1W, hyperintense on T2W with mild homogenous contrast enhancement of the mural nodule. The mural nodule was hyperintense on fluid attenuation inversion recovery (FLAIR) images. The tumor was intra-axial, extraventricular [Figure 1]. The possibility of pilocytic astrocytoma was entertained and the patient was operated through a fronto-parietal quadrangular flap craniotomy and gross total excision of the tumor was carried out. The tumor had a large cystic component containing xanthochromic fluid and a solid nodule of 2 x 1 cm. The tumor was well demarcated from the surrounding brain parenchyma and heterogenous in consistency. There was no communication to the ventricular system. Microsurgical gross total excision of the tumor was carried out. Histo-pathological examination revealed a malignant neoplasm with dense cellularity and formation of perivascular pseudorosettes along with microvascular proliferation and necrosis. Immunohistochemistry revealed epithelial membrane antigen (EMA). The tumor cells were negative for glial fibrillary acid protein (GFAP). The Ki-67/MIB-1 index was 25%. Overall, histological features were suggestive of anaplastic ependymoma with clear cell change [Figure 2]a-f. The patient was discharged on 7 th postoperative day and referred for radiotherapy. The classical radiological feature of a cyst with mural nodule is usually observed with low grade pathologies such as pilocytic astrocytoma. The other differential diagnoses include a ganglioglioma, hemangioblastoma and pleomorphic xanthoastrocytoma. 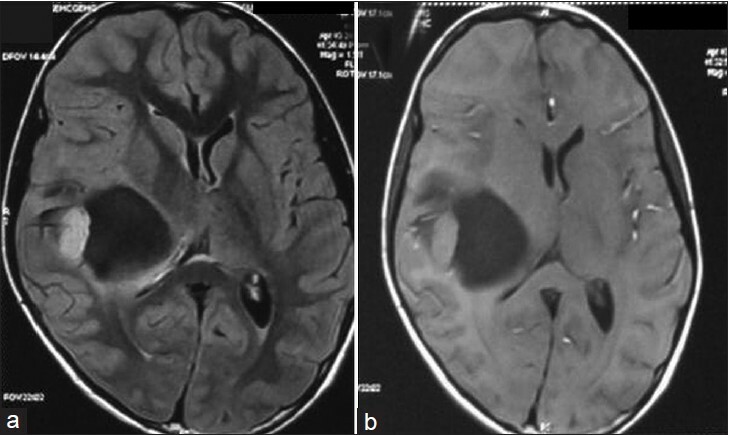 It is very unusual for a supratentorial anaplastic ependymoma to present in such a manner. Furie and Provenzale  analyzed the MRI appearance of supratentorial ependymomas and concluded that MR contrast enhancement pattern in supratentorial ependymoma can be heterogenous enhancement of a solid lesion, heterogenous enhancement of a cystic/solid lesion and although rare, an enhancing nodule in the wall of a cyst. To conclude, supratentorial extraventricular anaplastic ependymoma is an uncommon tumor which can rarely present as a cyst with mural nodule on imaging. In any case of a supratentorial cyst with mural nodule, the possibility of supratentorial ependymoma should be considered. 1. Van Tassel P, Lee YY, Bruner JM. Supratentorial ependymomas: computed tomographic and pathologic correlations. J Comput Assist Tomogr 1986;10:157-65. 2. Silverman CL, Thomas PR, Cox W. Ependymomas. In: Deutsch M, editor. Management of childhood brain tumours. Boston: Kluwer Academic; 1990. p. 369-82. 3. Palma L, Paolo C, Cantore G. Supratentorial ependymomas of the forst two decades of life. Long-term follow-up of 20 cases (including two subependymomas). Neurosurgery 1993;32:169-75. 4. Lin E, Escott E, Garg K, Bleicher A. Tumor and tumor-like lesions. In: Practical differential diagnosis for CT and MRI. New York: Thieme Inc.; 2008. p. 17-20. 5. Furie DM, Provenzale JM. Supratentorial ependymomas and subependymomas: CT and MR appearance. J Comput Assist Tomogr 1995;19:518-26.